Gemstones are gifts from nature. They are minerals, or organic matters that are cut and polished and made into gemstone jewelry, and other decorative items to be worn or displayed. The value of a gem stone depends on its rarity, beauty and durability. All gem stones are precious stones. In order to differentiate them, precious stones other than emerald, ruby and sapphire are usually referred to as semi precious stones. Right from the beginning, these three precious stones; emerald, ruby and sapphire, rule the gemstone market. Likewise, on this jewelry-making-instructions website, we will also refer to emeralds, rubies, and sapphires as precious stones and all other varieties of gems as semi precious stones. Diamonds are also classified under precious stones. Diamonds, emeralds, rubies and sapphires are usually highly priced. For this reason, jewelers will not drill holes onto them to be used as beads to be stringed. As such, these 3 precious stones are usually set against precious metal; namely gold or silver. Likewise smaller size precious stones are set into precious metal. Jewelry Making Tips: These stones are usually sold in strands. It is very tempting to unstrung these and store them like loose gems in jewelry boxes. Do leave them on the strands. As gem stones are of unequal sizes, they are placed individually on the string in such a way as to cause them to look like they are of uniform sizes. At the same time, when left on the strands, you will find it very easy to transfer a whole row of these stones onto your stringing wire at one time. 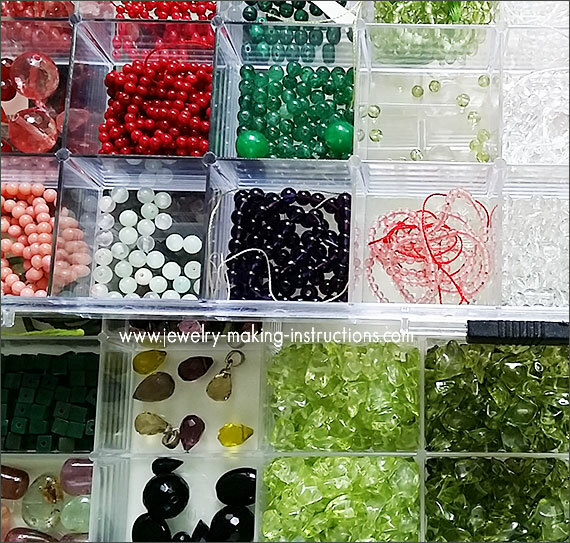 More Jewelry Making Tips: Heavier and bigger gem stones have plastic tubing placed in-between each stone as spacers. Do not remove these plastic tubing as they are placed there to keep each gem from knocking against each other and from being scratched and chipped. The above list of semi-precious stones is not exhaustive and as time allow, I will be adding more names onto this list.